Yes, I've been autumn-izing. And, yes, I just made up that word. When it shows up in Webster's dictionary, you know where it originated! A stuffed flannel wiener dog. Too cute, if you ask me! A pillow made from an antique woven rug. LOVE it! It's one of my finds from Oronoco Gold Rush Days this year. Last, but not least, a vintage leather medicine ball. A local antique store find from a few years ago. 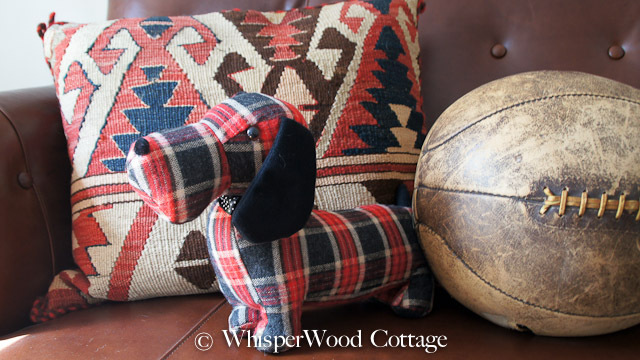 This is autumn-izing WhisperWood Cottage style! What a cute dog. Agreed, luv the pillow. Love the new word! The colors are the BEST in fall! I am lovin' that ball! I saw an old football in a store one time and wish I had bought it! When you autumn-ize you do it with a cute factor! Love that plaid pup! At our house we 'Christma-tize' when we turn all the lights on! The "wiener dog" is the cutest...love how you incorporated the old medicine ball...great idea!